"Really nice dish for company. I use fresh Dover Sole. Serve with rice and a fruit garnish." Preheat oven to 350 degrees F (175 degrees C). Butter a shallow baking dish that is big enough to accommodate all the fish. Slice the frozen spinach souffle into 4 equal pieces. Wrap a fillet around each piece, and place seam side down in prepared baking dish. 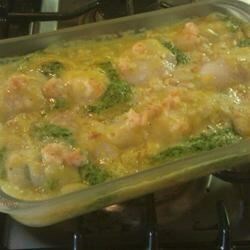 Pour undiluted soup over the fish, and sprinkle with small shrimp, Parmesan cheese, and paprika. Bake for 30 to 40 minutes, or until a fork can be easily inserted into the souffle. While this dish tasted good, it was a huge mess. The spinach souffle paired with the condensed soup ran all over the dish making it impossible to serve nicely. Very good and easy to make. There were no leftovers. I could not find cream of shrimp, so I used canned crab bisque. Quick, easy and your guests will rave - don't share the recipe and you'll be the talk of the neighborhood! My family liked it even though it was kind of salty.